For some time, we have been analyzing the way you use price lists and how it can be improved. 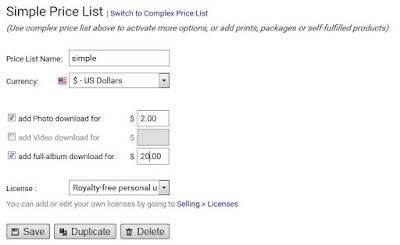 After simplifying licenses and product pricing, we are now offering you to choose between two price lists modes. The Simple Price list is especially useful for any newcomers to bluemelon. The new Simple price list provides all the essential tools for you to sell downloads in under a minute. 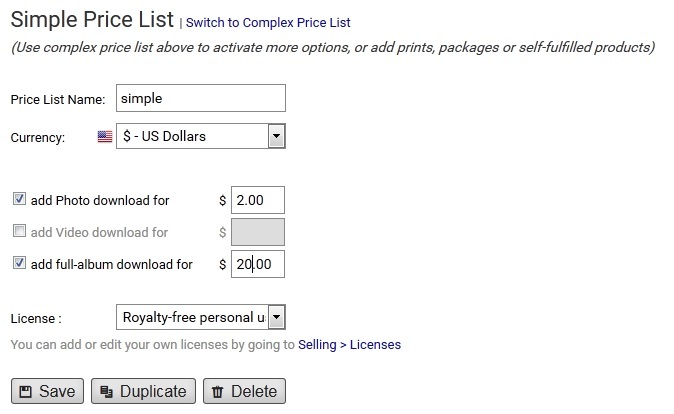 Whether you want to sell downloads of your photos, videos or even whole albums, all you need is to set the prices and a default price list for your account is created in the chosen currency and under a chosen license. Switching to the Complex price list mode widens the range of options. In this mode, you can manage prints, download product details, packages and self-fulfilled products in the familiar way. These modes are not compatible.